Perhaps the biggest story across the U.S. this week has been the polar vortex, a brutal surge of arctic air that sent temperatures plunging in 49 states. Today, the deep-freeze continues in many places around the country. Peanut’s owners have been charged with animal neglect — a Class A misdemeanor. Sure the polar vortex is making life difficult for humans, but a story like Peanut’s should serve as a reminder for us all that cold temperatures can be dangerous and even deadly for pets left outside. Monday night as the mercury dipped well below freezing in Dubois County, Ind., authorities received a tip about two dogs who’d been left in the yard of a home between the towns of Jasper and French Lick. “As a dog lover, I can’t imagine leaving a dog out when it’s that cold,” Dubois County Sheriff’s Office employee Stuart Wilson tells WFIE. When the authorities arrived on the scene, they discovered two shivering dogs left outside on the property. 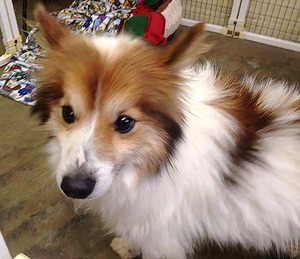 One was clipped to a leash, and the other, a Shetland Sheepdog named Peanut, was found inside of a small plastic barrel-style doghouse. “But it was not, certainly not appropriate for the temperatures we had last night,” Wilson says of the dog’s shelter. As they looked closer, authorities realized something horrible — temperatures were so cold that little Peanut had literally froze to the ground. “The dog, its stomach and feet and tail had frozen to feces that was in the pen,” Wilson explains. Rescuers needed to move quickly and carefully to remove poor Peanut from the ground. Using warm water to thaw the ice, authorities were able to free Peanut and get him to safety in 30 minutes. Dubois County Humane Society Executive Director Mary Saalman couldn’t believe it when she saw Peanut for the first time. Despite the exposure to the elements, Peanut did not suffer any frostbite. However, he was quite underweight, hungry, and dehydrated — all telltale signs of potential neglect. Shelter staff has also made sure to keep Peanut extra warm after his ordeal, giving him his very own fleece kennel blanket — Peanuts–themed, of course. Thankfully, Peanut is expected to be just fine, and several people have expressed an interest in adopting the little guy should the opportunity arise. Meanwhile, his owners were charged with animal neglect, a Class A misdemeanor. For more information about Peanut, check out the Dubois County Humane Society’s Facebook page. And for useful tips on how you can keep your dog safe in cold weather, check out DogTime.com today.